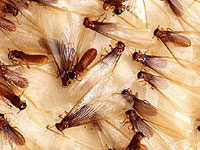 Termite season is just around the corner, and there is nothing you can do to stop them….or is there. For those of us who live here in the South, termites are an issue that must always be present in our minds. With the recent addition of some warmer days and a good supply of rain, termites will inevitably begin to get active again. In fact, we have already had a few cases where termite swarmers (flying termites…also called alates) have been reported. Termite swarms refer to the mating habits of termite colonies where termites fly out of the colony or “swarm” looking to find a mate and spread the colony. While the presence of termites at this time of the year is not extremely common, it does happen more times than you would think. If the conditions of the soil and the temperature around a colony are just right, then an early swarm is very possible. With that being said, all hope is not lost. With the proper protection in place, such as a liquid based termiticide application or the installation of a baiting system, we as homeowners can be prepared. While we may not be able to stop termites from swarming, we can make sure that our homes (most likely our most valuable assets) are not left exposed and vulnerable to a termite infestation. Call us today for a FREE evaluation of your home, and let us help protect what matters most.